The ONE Campaign is a nonpartisan 501(c)(3) organisation that educates the public and raises awareness of the crisis of extreme poverty around the globe and the progress being made against it through life-saving programs. (RED) is a division of The ONE Campaign, and partners with some of the world’s most iconic brands, such as Apple, Bank of America, The Coca-Cola Company, Beats by Dre and Belvedere, who contribute up to 50% of net profits from the sale of (RED)-branded products and services to The Global Fund to Fight AIDS, Tuberculosis and Malaria. ONE Action is a nonpartisan 501(c)(4) organisation that presses lawmakers to support smart, effective policies and programs that are saving lives, educating children and helping those living in the world’s poorest countries lift themselves out of poverty. Each year, ONE completes a Form 990 (see below) for both the ONE Campaign and ONE Action. This is an annual reporting return that federally tax-exempt organisations must file with the US Internal Revenue Service. It provides information on the filing organisation’s mission, programs and finances. The most recently filed form is for 2016. The ONE Campaign spent 82% of its budget on raising public awareness and educating policy makers in support of smart and effective policies and programs that are saving the lives of millions of people living in the world’s poorest countries. We strive to spend as much of our budget as possible on this work, which has a direct impact. Management and administrative tasks are necessary to run a global organisation that has offices in nine countries. ONE keeps management and administrative costs to a minimum. These costs include salaries for staff globally; legal, accounting and banking fees; and an allocation of indirect costs such as office rent, IT and cellular costs, and website costs. The ONE Campaign is funded by a combination of foundations, individual philanthropists and corporations. Thanks to the generosity of our donors, ONE does not solicit funding from the general public and is able to keep its fundraising costs low. The costs here include managing grant proposals and developing and maintaining donor relationships. The ONE Campaign continued its work to educate and raise awareness among the U.S. and Canadian public, media, and policymakers about the importance of official development assistance and international programs that combat HIV/AIDS, tuberculosis and malaria and fight hunger and famine in the developing world. At the Global Fund Replenishment conference in September, donors committed nearly $13 billion to the Global Fund to Fight AIDS, TB and Malaria – the largest multilateral commitment to global health in history and a nearly $1 billion increase from the previous cycle. While many partners around the world helped make this happen, ONE was among a small team—including the Gates Foundation, the government of Canada and the Global Fund itself—that drove the strategy and advocacy. In Canada, we succeeded in our public campaigning for the Global Fund Replenishment conference, built a new national network of advocates, and laid the groundwork for Prime Minister Trudeau to make bigger pledges in 2017. Canadian membership in ONE increased by over 30% in 2016, driven by extensive media coverage and member engagement on policy advocacy. In an effort to educate the public and policymakers about the importance of the foreign assistance budget in the U.S. under the newly elected President Trump, ONE relaunched our faith program in 2016. We had a strong presence at faith-based festivals, including Together 2016 (150,000+ attendance). We also appeared at events in houses of worship across the country, and partnered with Seacoast, a prominent Southern megachurch. We prepared materials to equip and educate our faith membership on the protection of the foreign assistance budget and prepared a strategy memo on the importance of U.S. faith communities. The ONE Campaign continued to raise public awareness of and engagement in the fight against extreme poverty and disease in Africa across Europe — in particular, Germany, France, the UK, the institutions of the European Union, the Netherlands and Italy. ONE also ran awareness-raising campaigns and advocacy activity in Ireland, Sweden and Australia. At the start of the year, we saw worrying signs that many European governments were looking to finance the cost of refugees arriving at their borders by redirecting part of their overseas aid budgets. In response, we formed a partnership with several NGOs, including Global Citizen, Oxfam and Save the Children, and launched a joint campaign — backed by over 115,000 people — explaining to European leaders they can meet the needs of refugees at home without sacrificing long-term development for the world’s poorest people. The joint campaign raised awareness of the issue across Europe and campaign successes included the Swedish government reducing the portion of its aid budget diverted to supporting refugees at home. We drove our transparency agenda forward through advocacy across three continents ahead of the London Anti-Corruption Summit in May 2016, with a focus on a five-point Fair Play Standard. At the Summit, France announced new public registers for companies and trusts, while the British government generated new policy commitments, reflecting a number of our policy asks. These included introducing a public beneficial ownership register for foreign owners of properties in the UK. Over 55,000 ONE members took campaign actions. We also contributed to the Open Government Partnership global summit in Paris. Across Europe, our Poverty is Sexist campaign activity included sharing our Poverty is Sexist policy report with the German Parliament, holding a panel event at the Women of the World Festival in London, and a campaign launch in Paris with Youth Ambassadors, celebrities, and the secretary of state for development, André Vallini. In 2016, we continued to expand our Youth Ambassador programme, recruiting more than 300 volunteer activists across seven European countries. We brought them together at the ONE Summit in Paris, alongside ONE activists from Nigeria. Throughout 2016, they helped raise ambition for the Global Fund – including meeting Bill Gates at ONE & (RED)’s reception in Rome ahead of the replenishment – and the French and EU foreign assistance budgets. In 2016, (RED) generated a total of $108 million for The Global Fund to Fight AIDS, Tuberculosis and Malaria (“The Global Fund”), through partnerships with leading private sector companies including Apple, Bank of America, The Coca-Cola Company, Beats by Dr. Dre, and Belvedere, among many others. During the year, seven new private sector partners joined (RED): Salesforce, NetJets, Piaggio, Lokai, Billecart-Salmon, Ergo Depot and S’well. In June 2016 for the third year running, (RED) once again rallied the culinary world to fight AIDS through its EAT (RED) SAVE LIVES campaign. Led by chef Mario Batali, the campaign launched with a (RED) Supper event for 600 guests that was created by ten leading chefs, including Anthony Bourdain, Tom Douglass and Nancy Silverton. Throughout the month, hundreds of special events in restaurants and bars around the world enabled people to join the AIDS fight by eating and drinking (RED). In support of World AIDS Day, the second annual (RED) Shopathon delivered a shopping extravaganza for the holidays. (RED) offered a number of winnable experiences with many of the world’s hottest stars on Omaze, and opportunities to shop more than 200 products that “give back.” The campaign generated $69 million for The Global Fund, including various dollar matching from The Bill & Melinda Gates Foundation. The (RED) Shopathon also created critical heat and awareness around the AIDS issue. Highlights included Jimmy Kimmel once again turning his entire show (RED) to launch the campaign, a special (RED) holiday shopping “infomercial” with Hollywood actress Robin Wright, and ten winnable experiences on Omaze.com with stars such as U2, DJ Khaled, James Corden, Julia Roberts and Neil Patrick Harris. The ONE Campaign produced four reports in 2016, starting with our second Poverty is Sexist report. There were three reports published as part of our DATA report series, each of which highlighted the need for increased and better aid for the fight against extreme poverty: The first report, Financing Stability, highlighted the need for increased humanitarian aid; the second report, the Africa DATA report, looked at health spending in Africa; and the third was our traditional DATA report, which tracks aid commitments from donor countries. We also published Stuck in Neutral: Tracking the Global Response to HIV/AIDS to continue monitoring progress on the fight against HIV. We also engaged in policy debates around the rising conflict on the African continent and developed briefings for how security and development can work together to fight against poverty. The ONE Campaign maintained its Africa office in Johannesburg, South Africa, from which it strengthened its staff capacity and expanded relationships with key African and international civil society partners, policy makers and influencers to fight against extreme poverty. The ONE Campaign’s key focus for 2016 was on a health campaign in Nigeria, agriculture campaign in Francophone Africa and engaging the African Union to advance our key issues of increasing health and agriculture investment, as well as transparency and accountability systems and processes on government budgeting and procurement processes. In January 2016, we successfully launched the Nigeria Champions program in Abuja. We recruited a total of 23 “champions” who we trained on policy making in Nigeria. The Champions program formed part of our member engagement strategy and the champions played a leading role in supporting our state and federal level campaigns. In April, we launched our Make Naija Stronger (MNS) health campaign. To amplify the campaign, in partnership with the Dangote Foundation, we visited the North East Nigerian city of Maiduguri in Borno State, where we visited camps for Internally Displaced Persons. High-level meetings with the Nigerian Vice President, Professor Yemi Osinbajo, and the President’s Chief of Staff, Abba Kyari, helped to educate policymakers at the highest level of the Nigerian administration. ONE, in coalition with 76 CSOs in the health sector, engaged in a process to develop a shadow health budget and a Medium Term Health Sector strategy, which were then used to develop a memo that was co-signed by all the coalition members. The memo was presented to all the relevant government agencies in Nigeria. Two creative campaigning assets were launched during the MNS campaign: a PSA titled “I am In… To Make Naija Stronger” and a short documentary on the health situation in Nigeria. For the PSA, we engaged eight famous Nigerian artists: Waje, Toolz, Hon. Desmond Elliot, Falz, Yemi Alade, Basketmouth, Kate Henshaw and Ali Nuhu. We also leveraged on a number of key moments to recruit members. ONE’s Francophone representatives integrated the continental Non State Actors Coalition (CNC) for the monitoring of the Comprehensive African Agriculture Development Plan (CAADP). Since the African Union launched the CNC at the 11th CAADP Partners Platform Meeting in Johannesburg in March 2015, the coalition has been actively engaged in bolstering their energy in the CAADP implementation process at national, regional and continental levels. CNC is a platform that brings together non-state actors (farmers, pastoralists and fisher folks organisations, as well as civil society, women small holders, youth, media, the private sector, and academic organisations) from across Africa. ONE participated in the meetings and bi-weekly calls of the CNC to explore means of contributing to CNC initiatives. ONE supported the publishing of the analysis on the Comprehensive Africa Agricultural Development Programme (CAADP) implementation in Senegal. This is now a central tool for tracking progress on agriculture reform in Senegal and in Africa. This publication is the first analysis conducted on CAADP by CSOs. This placed ONE Campaign as a leader in empowering CSO advocacy on CAADP through data. In partnership with the AU, ONE seized the opportunity of the various technical and high-level AU forums to call for the African government to adopt the catalytic framework to end AIDS, TB and malaria in Africa by 2030. This included a call for African governments to support the Global Fund. The July Africa Union summit in Kigali adopted all of our recommendations in the framework without any amendments. ONE also joined a high-level AU panel entitled “Ending AIDS by 2030” at the International AIDS Conference (IAC), where the framework was discussed and ONE called on African leaders to boost their financial commitments for the fight against the HIV/AIDS and implement the Abuja commitment. ONE Action’s advocacy work plays a valuable role in persuading lawmakers to protect and, where possible, increase funding for ONE Action’s core priorities. ONE Action’s members are highly engaged advocates and contributed valuable support to ONE Action’s major campaigns. ONE Action’s advocacy work continues to play an important role in persuading US and European lawmakers to protect and, where possible, increase funding for ONE Action’s core priorities. ONE Action’s members are highly engaged advocates and contributed valuable support to ONE Action’s major campaigns. Advocacy: ONE’s advocacy work continues to play an instrumental role in persuading U.S. lawmakers to protect and, where possible, increase funding for our core priorities. We secured major wins in the U.S. in 2016, including the enactment of four pieces of major legislation in the United States: the Electrify Africa Act, Dodd-Frank 1504, the Global Food and Security Act, and the Foreign Aid Transparency and Accountability Act. In February, our multi-year campaign for the Electrify Africa Act came to a successful close as President Obama signed the legislation into law that would give 50 million people in sub-Saharan Africa first-time access to electricity. In all, ONE members organised thousands of letters, tweets, phone calls, and petitions, and held hundreds of meetings with their leaders in Congress. In June, the SEC issued a strong final rule to implement Dodd–Frank 1504. ONE and Oxfam America submitted a joint petition to the SEC with thousands of signatures along with hundreds of letters from ONE members. In addition, the SEC cited substantive policy submissions from ONE more than 100 times. ONE, along with a small team of NGO partners (including CARE, Interaction and Bread), played a critical role in the passage of the Global Food and Security Act (GFSA) in July. ONE members placed thousands of calls and letters and held hundreds of meetings to ensure that the U.S. builds upon the successes of existing efforts to improve global food and nutrition security. Additionally, in July, ONE’s GR Team took a lead role in passing the Foreign Aid Transparency and Accountability Act, legislation that improves the way foreign assistance is monitored and evaluated. ONE Vote ‘16: ONE Vote ‘16 was a campaign to secure policy commitments from candidates, cultivate relationships with future leaders, and demonstrate constituency support for international development. The ONE Vote Caravan, featuring a virtual reality experience and an inflatable White House bounce house, traveled over 6,000 miles, stopping in 17 states for 27 different events. Our advocacy efforts combined high-level relationship building and visible public campaigning, including the mobilization of 120 volunteers to get thousands of members to sign the ONE Vote petition asking candidates to develop a plan to end extreme poverty before entering the White House. Our members engaged the Trump campaign thousands of times throughout the election cycle. While ONE Vote ’16 had an initial emphasis on the Presidential election, we also developed relationships with successful Congressional candidates. In the primary season, we launched a grassroots campaign (over 100 candidate intercepts and video statements from candidates); and in the convention season, we held 11 events over two weeks that engaged Congress, NGOs and new ONE members. Advocacy: In Canada, we established relationships with senior officials in the Trudeau Government and Members of Parliament. In particular, we facilitated relationships between the Prime Minister’s Office and key development sector leaders, engaged the Prime Minister as a key global spokesperson for Poverty is Sexist, and supported a successful Global Fund replenishment campaign. European donors pledged $6 billion to the Global Fund, which included a 27% increase from the European Commission on its 2014-16 pledge. After lobbying from ONE and partners, Italy increased its pledge by 40%, both France and Sweden maintained their 2014-16 levels, Germany increased its pledge by 33% (an increase its contribution for the first time in ten years), Australia increased its contribution by 10% — despite an overall context of aid cuts — and the Netherlands topped-up its original pledge with €10 million. We ran a ONE Vote Ireland campaign for the general election, calling on candidates to commit to ending extreme poverty, malnutrition and preventable disease in Africa by ensuring that most Irish aid goes to countries that receive the least and that women and girls are at the heart of development. ONE members signed our petition calling on candidates to make this commitment and Irish Youth Ambassadors targeted their representatives with this pledge after the general election. Towards the end of the year, we began to prepare campaign and advocacy plans for 2017 parliamentary and presidential elections in France, Germany and the Netherlands. Management and administrative costs include salaries for global operations staff, including the finance, HR and office management; legal, accounting and banking fees; and an allocation of indirect costs such as office rent, IT and cellular costs, and website costs. ONE Action is funded by the ONE Campaign and individual philanthropists. Thanks to the generosity of our donors, ONE Action does not solicit funding from the general public and as such, is able to keep its fundraising costs low. ONE and (RED) are funded by a combination of foundations, individual philanthropists and corporations. We do not solicit funds from the general public or receive government funding. Below is a list of our financial supporters who have contributed at least $25,000 annually to our work since January 2017. Some of our donors have asked for confidentiality and we respect this request. 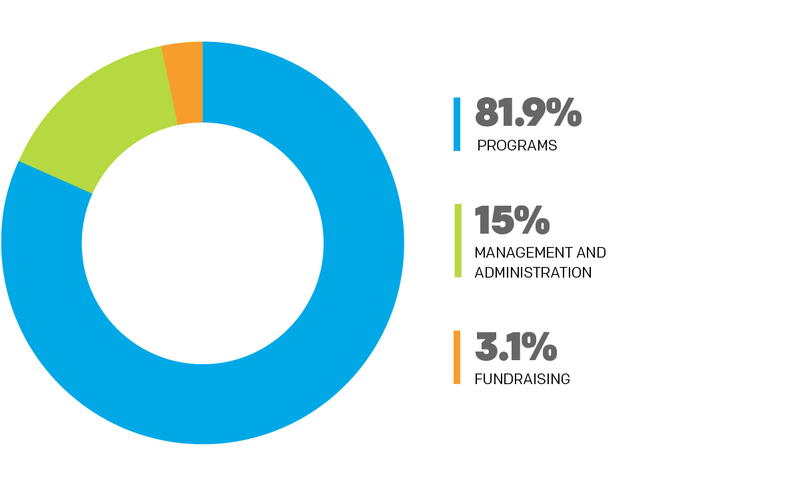 Funding from anonymous donors amounts to less than 1% of our total grants and contributions.